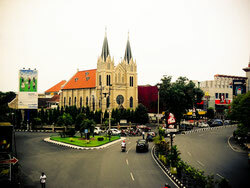 Surabaya is the capital city of East Java province , Indonesia as well as the largest metropolitan city in the province. Surabaya is the second largest city in Indonesia after Jakarta. 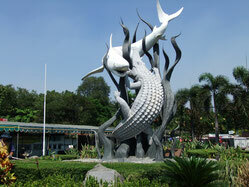 Surabaya city is also a center of business, commerce , industry , and education. Surabaya is known as the City of Heroes because of its history very calculated in the fight Arek - Arek Suroboyo ( Youth - Pemuda Surabaya ) to maintain the independence of the Indonesian nation from invaders. Mount Bromo is an active volcano in East Java , Indonesia . This mountain has an altitude of 2,329 meters above sea level and located in four districts. 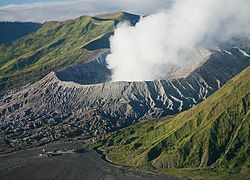 Mount Bromo shape mesh between valleys and canyons with the caldera or the ocean of sand covering approximately 10 square kilometers. Malang is a city located in the province of East Java , Indonesia . It is located 90 km south of Surabaya and is the second largest city in East Java after Surabaya. Malang is known as one of the educational objectives prominent in Indonesia because many universities and polytechnics public and private -known to all of Indonesia and became one of the goals of education are in this city , some of which the most famous is the University of Brawijaya University of Malang , and University of Malang.